← I never thought I’d see the day! 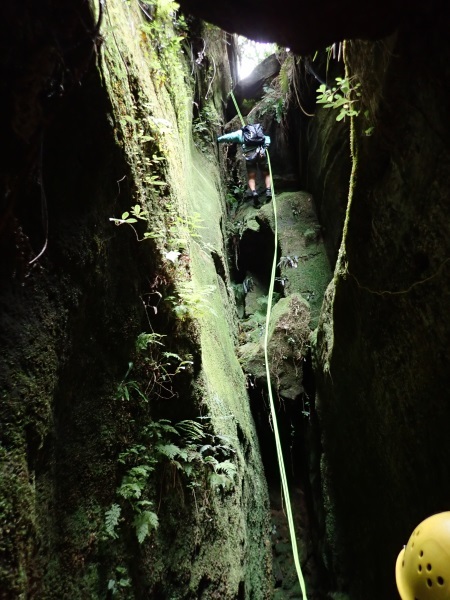 Many, many years ago, when I first started canyoning, I suggested to Lindsay B that we do David Crevasse. He shook his head firmly, if he’d had jowls at that time they would have quivered, “NO, no, definitely not, too much lawyer vine”. Well, 25 years later I finally got to do it, and without having to battle the lawyer vine. 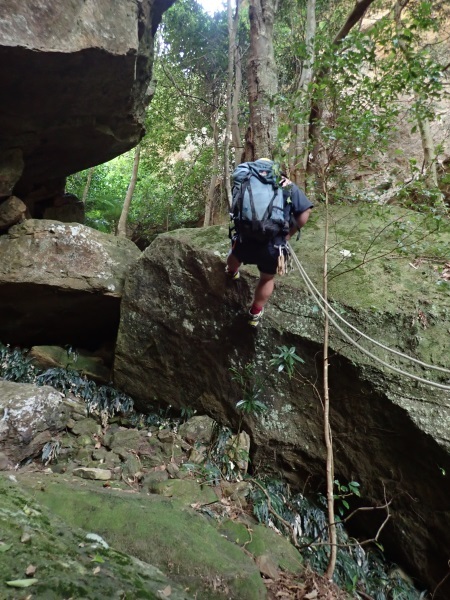 Up until a year or so ago, it was usually an overnight trip; that was another deterrent, lawyer vine, boulder hopping AND an overnight pack. 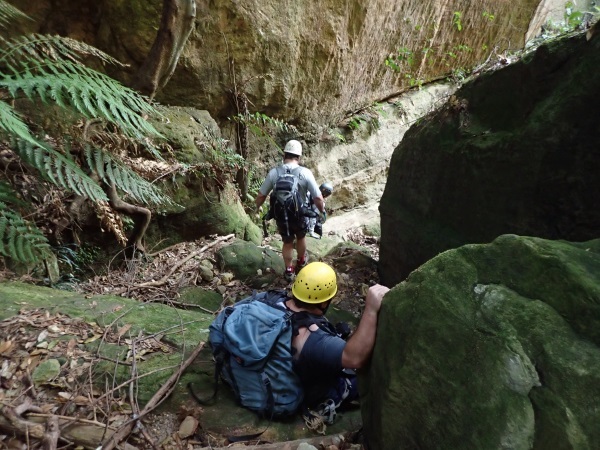 Plus, you had to walk upstream on the Grose to Pierces Pass and climb a really big hill to get out, again with a heavy overnight pack. Of course, some fit people (unlike me) did it in a day, usually in the summer with long daylight hours. 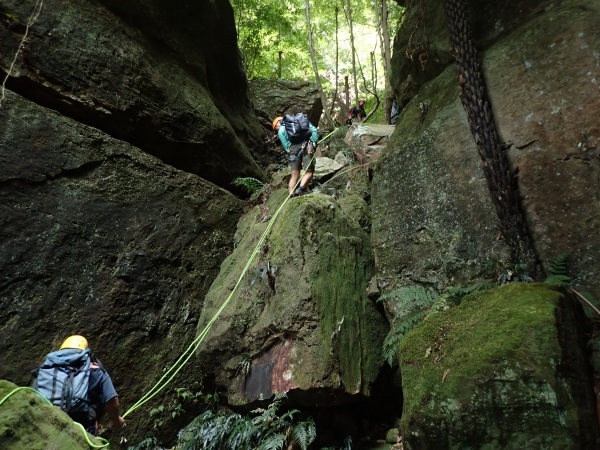 Over the years, I’d camped down on the Grose opposite the Crevasse and looked at it longingly, but the thought of lawyer vine and carting an overnight pack through the trip just turned me off. Then, I heard that you could now do it as a day trip, there was a route and all you had to do was prussik up 12m or so and then it was an easy walk out. How hard could it be? 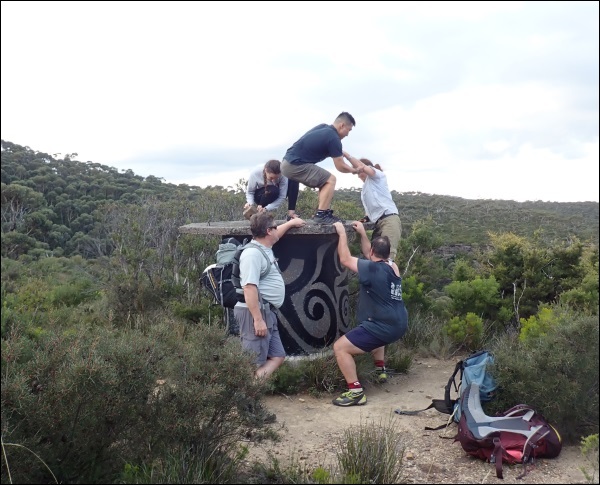 With potential rain forecast on Sunday (which didn’t eventuate), I cancelled my day walk to Mogo (sorry Len), and met up with Rod S, Chris J, Heather R, Chin and Cecile at Mt Banks to do, what would be for us, an exploratory trip, none of us had done it before! Very exciting. The walk in from the car park looked long, on a fire trail, but in fact it was quicker than I expected. Looking out into the Grose at Frank Hurley Head, great views, pity about the overcast sky. They were a bit closer to the edge than I was comfortable with, but I was assured there was another ledge below them. Looking back at Mt Banks. 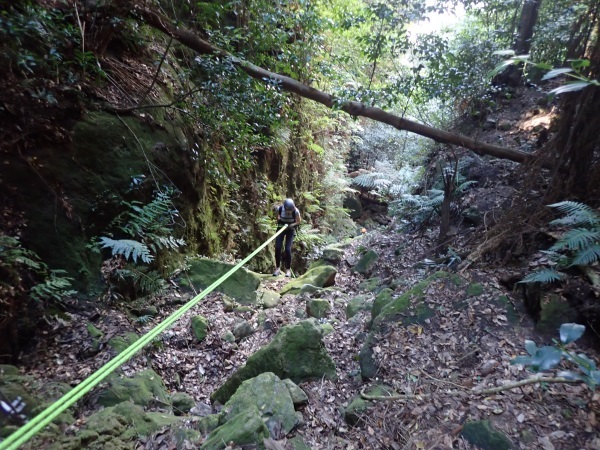 Many years ago, Mt Banks was a classic abseil trip, 10 abseils, all around 50 or 60m but then NPWS went in and took out all the bolts (for the anchors) and now it’s “off limits”. It’s possible someone has gone in and replaced them, but I haven’t heard of anyone doing the trip these days, you certainly wouldn’t want to be caught doing it, and it’s quite visible from vantage points around the Grose, so it’s not like you could do it in secret (lol). We arrived at the place we figured was the entry point. Chris, Heather and I all thought that we were entering too soon, Rod was convinced we were on the right track (or footpad). Much to our annoyance, turns out Rod was right! 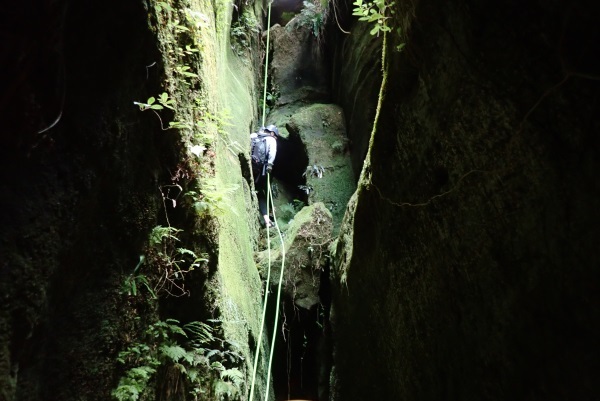 One reason why I didn’t think it was the entry track was that there wasn’t a more well formed track down to the first abseil, but it’s quite open, so people probably spread out. Eventually Rod was vindicated when we arrived at a lovely new purple sling, and Rod set up his new bright green rope. 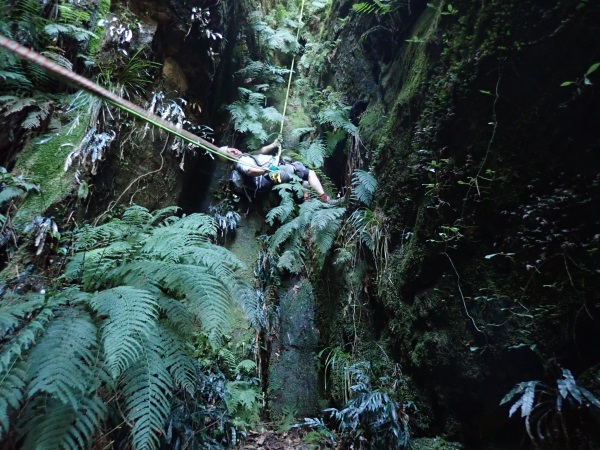 Here’s Cecile on the first abseil – this was to be Cecile’s second “canyon”, we were certainly throwing her into the deep end but she handled everything like she’d been doing it for years. Chris on the first abseil. Cecile on the 2nd abseil. 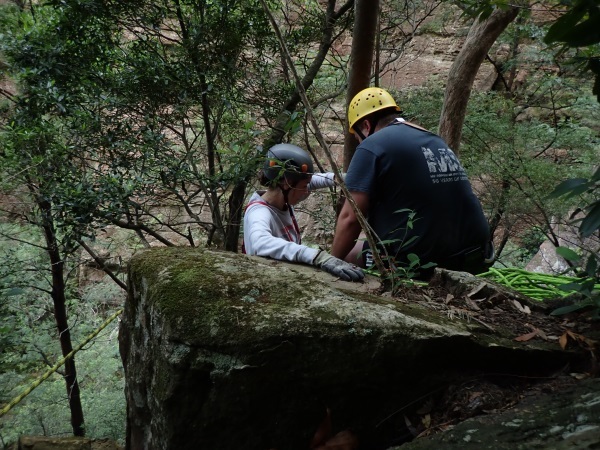 The 2nd abseil was a bit of a pain, sort of overhung, but not a great overhang, I made it look bad but Rod and everyone else nailed it. A little bouldering before the next abseil. Cecile on the 3rd (lovely) abseil with Rod belaying. Chin on the 3rd abseil. Chin on the 4th abseil. Heather on the 5th abseil, this was longer than we expected, but when I got to the bottom, looked like it was about 20m. There was a lovely mossy chute to the left, looks like people had gone down that way too but we didn’t wand to churn up the moss. By now Chris, who doesn’t get out much, is getting tired so thought he’d lay down on the job. 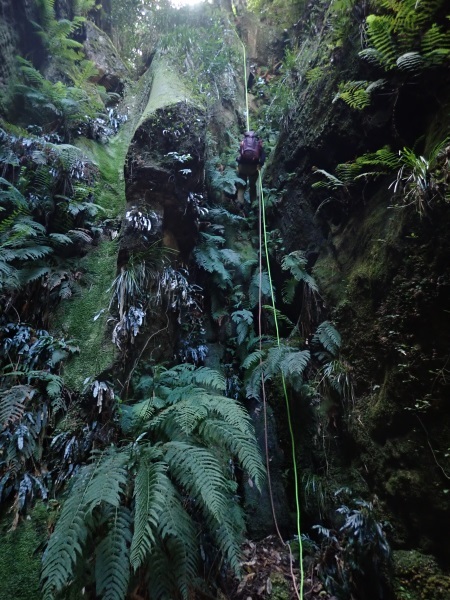 Chin on the 6th abseil, another really nice one but with a few tricky overhangs. Cecile on the 6th abseil. 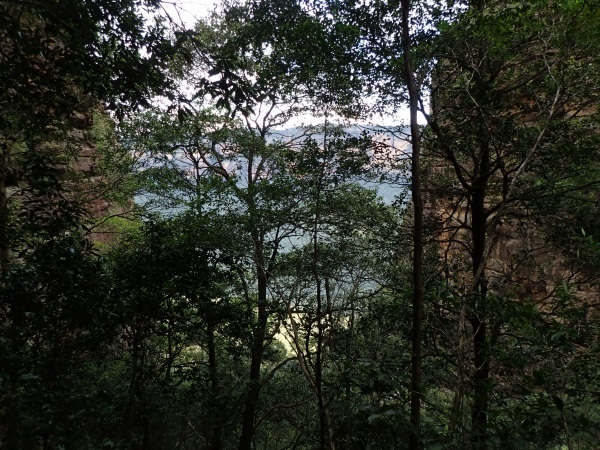 At the end of the 6th (and final) abseil, looking out into the Grose Valley. I was unsure as to whether or not we were on the exit route (it’s apparently a “secret” route). 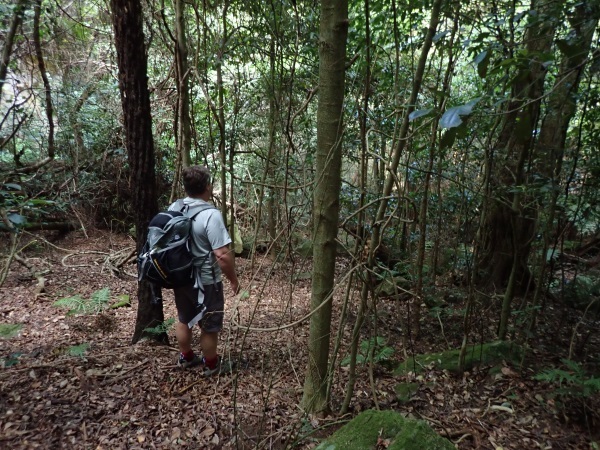 But I continued along what I though might be the route and sure enough eventually found a small handline. 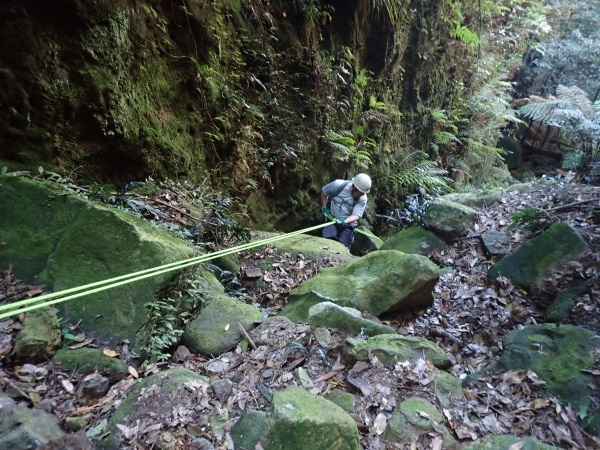 We stopped for lunch and then tackled the handline which I didn’t like at all, very exposed on one side. Just beyond the handline we spied the fixed rope. Nice, 11mm and looked new, so we were all confident of using it. Chris and Heather had brought their mechanical ascenders, Rod and I had our prussik loops. 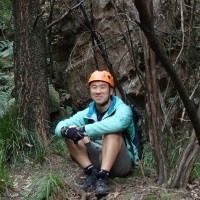 Chin, who’d only learned prussiking at the recent Field Day, had new prussik loops to try out. It would be Cecile’s first go at prussiking, not the best place to learn, but she’s running out of time to do canyons with us as she’s going back to France in July, so we figured we’d top belay her. I prussiked up first, took a while with my prussik loops, and wasn’t at all happy at the top on the teeny tiny ledge that you had to stand on to get off the rope. I set up a safety for everyone to make it safer. Rod came up next and then Heather (with mechanical ascenders) came up very quickly. She then sent the mechanical ascenders down for Cecile. For her first go at prussiking with mechanical ascenders, Cecile was fine, quickly up the rope, Rod belayed her with his green rope. It’s always hard getting off the rope with the cams but she was safely hooked on. The prussik was quite exposed as you can see. 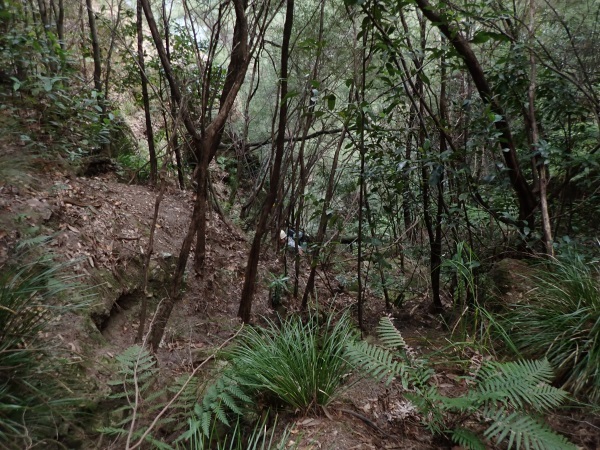 Once we were all up, we headed up the gully. There was one spot that was a bit exposed, but there were lots of trees to hang onto so I was quickly past that. 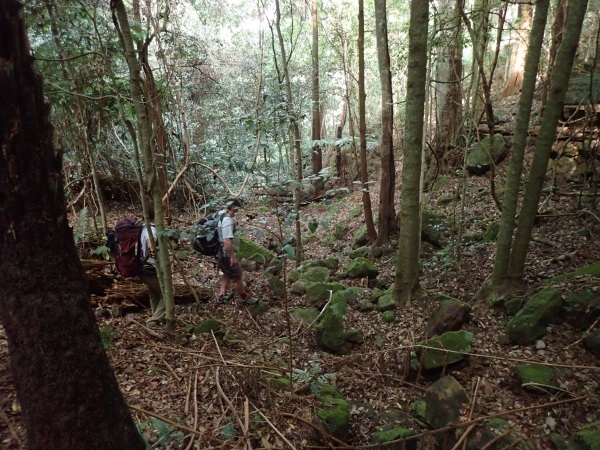 The rocks in the gully were quite loose, evidence that not many have used the exit yet, after a couple of years, all the loose rocks will have fallen down the gully and the route would be bare rock or hard packed dirt. Chris making his way up, the gully seemed to go on forever and then we heard the distinctive yell of relief when Heather reached the fire trail. The walk out wasn’t too bad, although by the end I was really, really tired. Car to car it was about 9 hours, we could have shaved an hour off that if we’d been more efficient setting up ropes etc, but we wanted to enjoy the trip with each other (it was a great group) and couldn’t see the point in leap-frogging. The walk in/out was 10k so was a good fitness walk for me as there were a few small hills. Whoever discovered this route in, and put in the fixed rope, a big THANKS! And, thanks Rod for suggesting the trip and agreeing that David Crevasse was a good one to do; thanks everyone for your great company; and thanks Heather for driving to/from the Coast with me (2.5 hours there and back is a long drive for a day trip!). 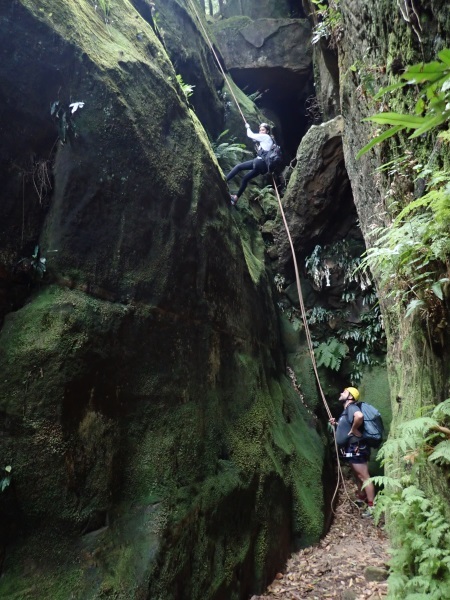 Banner: the Crevasse was very green with lots of ferns and moss. Thumbnail: Chin, one of our newest members, waiting with me for the guys on the exit route. 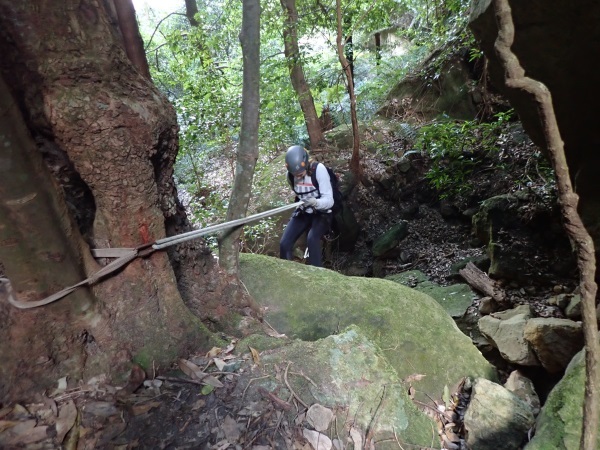 This entry was posted in Abseiling, Canyoning, MSS. Bookmark the permalink. Yes, was a good trip, but wouldn’t rush back to do it again, so many other trips out there. Beautiful scenery! Thanks for sharing! 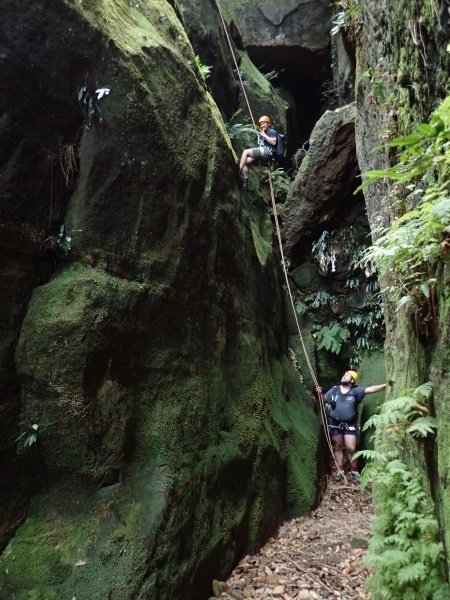 Yes, the overall feeling I had was of green-ness, very pretty and a nice trip to end the summer canyoning season on.